Electrical Hazard Protection meets ASTM F2892-11 standards. This affordable leather oxford is the perfect work shoe for your work day. The front and design of this unisex oxford has a more athletic form, and it is made of high quality smooth leather and polyurethane lightweight dual-density sole for durability. It boasts safety features that protect your feet, as well as COMFORTTUF® removable footbed to help keep your feet comfortable during your work day. 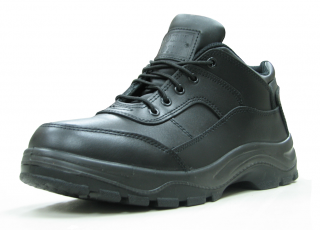 This shoe is the perfect combination of quality, comfort, and affordability that keeps Work Zone® a popular choice for the working person.